There are two common forms of manual hospital beds which are used widely throughout the healthcare sector; the stretcher and the gatch bed. Both forms of bed are absolutely essential in healthcare and perform their own unique function to a very high standard. However, it is extremely important to choose a manual bed which is suitable for the purpose for which it is envisaged. With proper care and attention during the acquisition process, a superb range of manual hospital beds can be purchased which will perform their task to the highest possible standard. The stretcher is the most basic form of any of the manual hospital beds. It is designed primarily for mobility, allowing patients to be transferred from the scene of an incident to an ambulance or helicopter and then from there to a hospital with the greatest ease and simplicity. While the stretcher will keep the patient in relative comfort in the short term, it is not designed to be used over a prolonged period of time. Modern stretchers often have a range of additional features including extendable legs or even wheels to increase mobility and increase the flexibility of use. The gatch bed is most basic form of all of the manual hospital beds that are likely to be found within a hospital ward. It is particularly suited to use in areas where funds are limited and where infrastructure is limited or even non-existent. This is primarily due to the low acquisition and support costs and the lack of a requirement for electricity. The gatch bed is adjusted using a series of three cranks which are located at the foot of the bed, operating the elevation of the entire bed, the head of the bed and the foot of the bed respectively. The primary disadvantage of manual hospital beds is the need for the assistance of medical professionals in changing the position of the bed. Whereas electric beds can be operated by the patient themselves, there is no way that manual hospital beds can be operated from within the bed itself. Furthermore, electric beds can be positioned with greater accuracy than manual beds with greater scope for precise adjustment. Such features are greatly appreciated by patients who have special conditions which result in pain when in certain positions. By being able to position a bed precisely the standards of patient comfort are greatly increased. 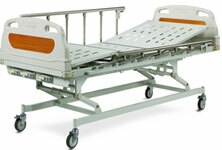 Both stretchers and gatch beds have specific roles as manual hospital beds which they perform admirably. The stretcher continues to be used now and for the foreseeable future in emergency situations to transfer patients in critical condition. Modern developments in stretcher technology have ensured that the stretcher has maintained its relevance in the modern world. Although superseded by electric beds in the developed world the gatch bed continues to be of relevance in less developed countries where resources may be limited or where the infrastructure may prove to be inadequate for the use of electric beds.